Vamaa E-Education Equipment Products are the combination of an essential core technology, Continued Innovation, award-winning design, and comprehensive price performance. We are offering Elearning Services to our clients. QBS has experience and skill in designing and creating iBooks using the iBook Author platform and implementing the standard features supported by IBA. We develop custom widgets that can be integrated into your iBooks to make them stand out from the rest. - Custom widgets for IBA. E- Learning is another domain which we have expertise to serve; we have created softwares for school management, online education. Creative and Artistic web sites for education of students to teach them with innovative education techniques. We also have helpdesk softwares to support online education system. 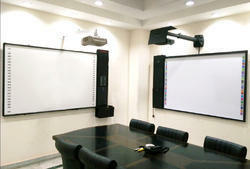 Leveraging on our huge industry experience and expertise in this industry, we are offering E Learning to the patrons. Our experience in this domain has helped us to develop a strong base in the market. This service is highly acclaimed correctness. We also keep a close eye on the entire process to avoid any discrepancies. · Based on revised syllabus. · Extensive Study Material- Each topic explained in PPT format using relevant examples, diagrams, tables & graphs which will help students to understand the subject through simple learning method. Android based LED projector, connected to Wi-fi internet dongle and bundled with one year membership of E-Library of online content for classes KG. to 10th.